In a perfect world, preventive care with oral hygiene and healthy habits would eliminate the need for restorative dentistry altogether. Unfortunately, that’s not the world we live in. Sometimes, things happen. If it’s not tooth decay or gum disease, it’s a chip or break from a popcorn kernel or olive pit. Maybe you stood too close to the piñata at your daughter’s birthday. Whatever the reason, if you need a tooth repaired, restored, or replaced, Dr. Spagnuolo and our team at We Smile Dentistry can digitally design, create and place many restorations in a single visit with our CEREC® same day technology. If you’ve ever had a tooth restored in the past, you may remember it was a process that involved goopy impressions, an off-site dental lab, a temporary restoration, and a few weeks between multiple appointments. This is still the process at many dental offices today, but not at We Smile Dentistry. We’re proud to offer the dental technology that shrinks the whole process down to a single piece of chairside equipment, and a single appointment. CEREC® stands for Chairside Economical Reconstruction of Esthetic Ceramics, or CERamic REConstruction. Instead of unsightly, unstable, and potentially toxic metal amalgam, CEREC® uses a highly durable ceramic that can be perfectly colour matched and shaded to blend in seamlessly with your natural teeth. CEREC® helps us create same day crowns, bridges, inlays/onlays, and veneers. Restorations with CEREC® can give you your beautiful, complete, healthy, functioning smile back, with the whole process completed in just one visit. If you have a chipped tooth or an area of decay that’s too large to treat with a filling, we may be able to avoid a crown with an inlay or onlay. Inlays and onlays are more conservative than crowns because they don’t require any removal of healthy tooth structure to place. An inlay is designed to repair damage contained within the cusp (outer ridges) of the tooth, while onlays are slightly larger and repair damage that extends beyond the cusp. Inlays and onlays are designed to strengthen and fortify the natural tooth structure, rather than replace it. Inlays and onlays help us preserve your natural tooth for as long as possible while restoring the tooth and allowing you to enjoy your favorite foods again and smile with confidence. 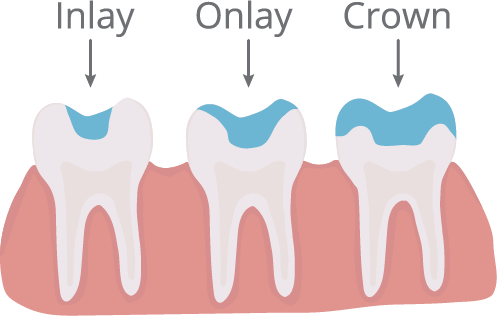 If you have a badly decayed or broken tooth that is beyond repair with an inlay or onlay, our next best option will be a crown. A crown is a tooth-shaped cap that fits over any remaining healthy tooth structure. Crowns do require some preparation of the natural tooth to make room for the crown and ensure the best fit and strongest bond. Thankfully, your London dentist can complete dental crowns in a single appointment with CEREC® technology! If you have a decayed or broken tooth, you should seek treatment right away before the problem gets worse. Leaving teeth untreated leaves them weak and vulnerable to further decay and damage. Surrounding teeth can also start to shift and rotate without the support of the healthy tooth in between. If you need a tooth repaired, we can digitally design, create, and place a beautiful new crown all in a single appointment. If you’re missing a tooth or multiple teeth, we can replace what you’ve lost with a beautiful, functional, and durable porcelain bridge. 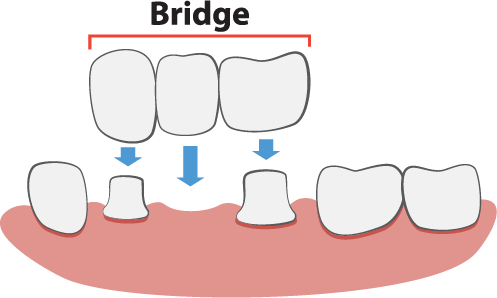 Bridges typically consist of one or more fabricated teeth, anchored to surrounding teeth with crowns on either side. Anchoring a bridge with dental implants offers even more security and jawbone health while keeping surrounding teeth intact. When teeth are missing, we always recommend dental implants, especially as a single tooth solution to a single tooth problem. In the past, we would have to place a bridge to replace a single tooth, which involves removal of healthy tooth structure on either side. If we can place a single dental implant with a full crown, we can keep your healthy teeth intact for as long as possible. If you are not a candidate for or cannot afford an implant, a bridge is your next best option for replacing a missing tooth. If you are missing multiple teeth in a row, a bridge can restore the balance to your smile and allow you to enjoy the function of a healthy mouth again. If you are a candidate for dental implants, we can use two implants to secure the bridge and keep your abutment (neighboring) teeth intact. With CEREC® same day technology, we can complete many bridges in a single appointment! If you’re missing most or all of your natural teeth, it may be time to consider dentures. Don’t worry, today’s dentures are a far cry from those of your grandparents. At We Smile Dentistry, we’ve helped many patients improve their smile, their confidence, and their quality of life with life-like modern dentures that look, feel and function just like natural teeth. If you’re living with old dentures that don’t fit well and slip out of place, we can provide a denture that fits better and looks and feels more natural. 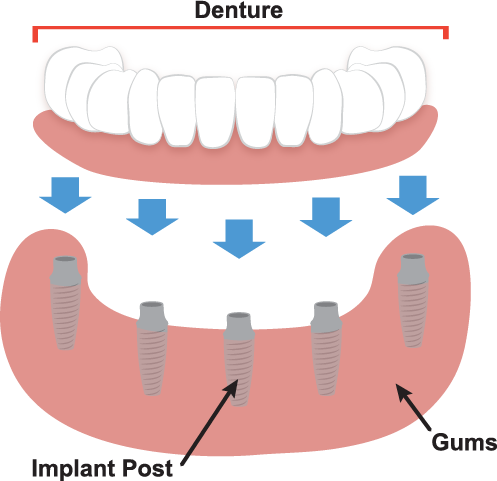 If you are a candidate for dental implants, we highly recommend implant supported dentures for the most secure, life-like solution. If you still have some healthy teeth remaining, we want to keep those healthy and intact for as long as possible. We can design a partial denture that leaves space for your remaining teeth to keep functioning together with the new ones. If you’re missing all of your natural teeth, our dentures are designed to provide support for the lips and cheeks, and made from durable ceramic and acrylic to mimic your natural smile in every way. If you are a patient with a healthy enough bone density, we highly recommend dental implants for securing the jawbone and providing a sturdy anchor for the most life-like set of dentures available. If your mouth has been devastated by years of dental neglect, chronic teeth grinding (bruxism), or a traumatic injury, you may be wondering if there’s any hope left for your smile. We want you to know you are in the most skilled, compassionate, and capable hands with Dr. Spagnuolo and our team at We Smile Dentistry. We are dedicated to helping our patients improve their confidence and quality of life with excellent dentistry, and can help you rebuild your smile from the ground up. Will I end up in dentures? Maybe, but not necessarily. At We Smile Dentistry, our goal is to keep your natural smile healthy for as long as possible, so we will do whatever we can to preserve what you have left and rebuild only where we need to. If you do need dentures, don’t worry, our modern denture options are designed to look, feel and function just like natural teeth. If you have any questions about restorative dentistry or would like to schedule a visit, please give us a call at (519) 661-0042 or get in touch with us online. Your London dentist, Dr. Giulio Spagnuolo and our team at We Smile Dentistry look forward to smiling with you! Serving smiles from London, St. Thomas, Lucan, Dorchester, Strathroy, and beyond! Please call us at (519) 661-0042 or fill out the form below to request an appointment.